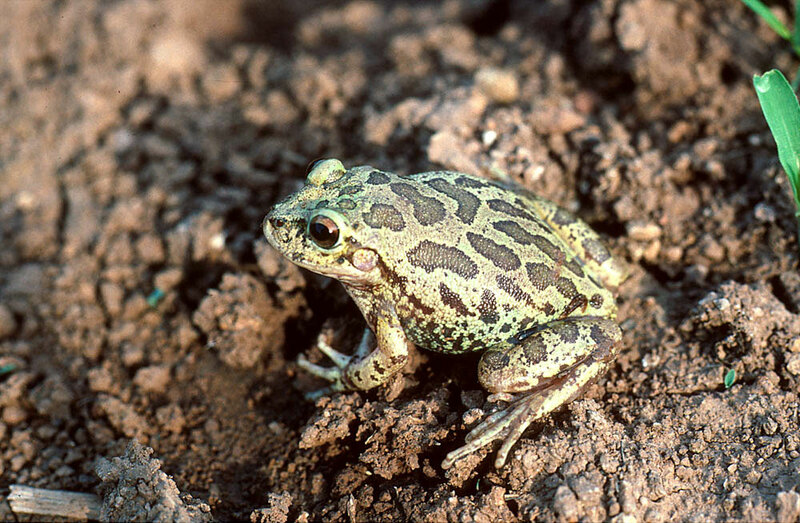 The Sinaloan narrow-mouthed toad (Gastrophryne olivacea mazatlanensis) is a secretive little toad that is found from Sinaloa north to Arizona in tropical, desert, and grassland habitats. It is a western subspecies of the Great Plains narrow-mouthed toad (G. o. olivacea) which is found from the Great Plains southward into north-central Mexico. On rainy nights its nasal call resembles a band of sheep mewing. Photo: G. M. Ferguson northwest of Tepoca, Sonora. 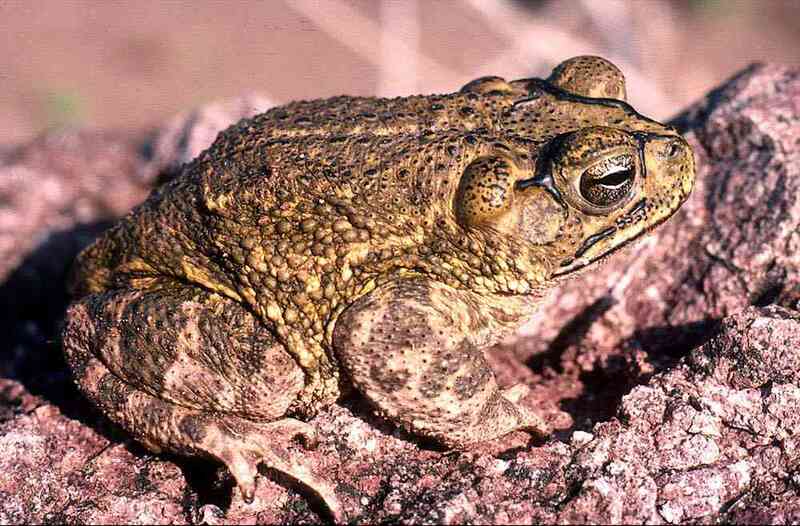 The Mazatlán toad (Bufo mazatlanensis) is common in tropical lowlands from southern Sinaloa north to east-central Sonora. 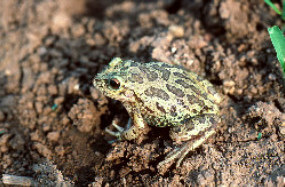 It is a northwestern Mexican member of the Gulf Coast toad (B. valliceps) species group which have prominent cranial crests on the head. Photo: G. M. Ferguson northwest of Tepoca, Sonora. 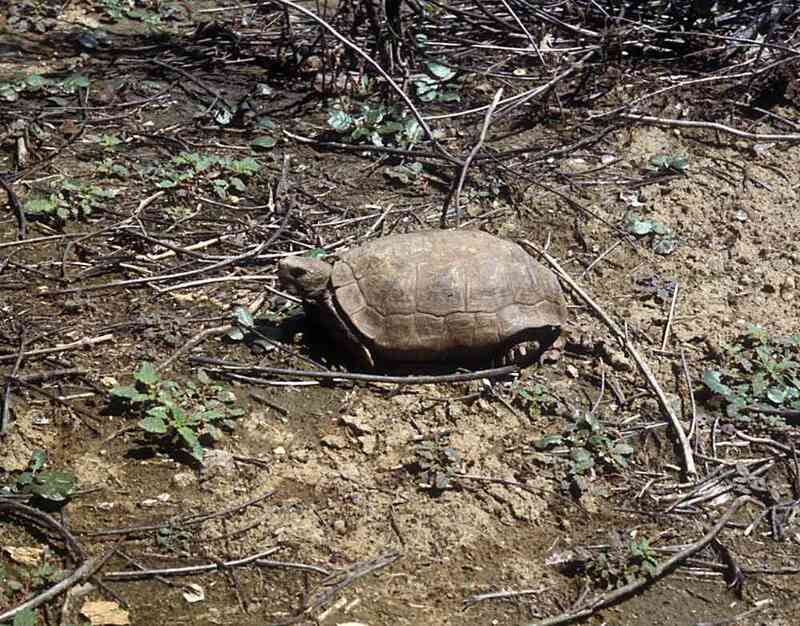 The desert tortoise (Gopherus agassizii) is found from northern Sinaloa north through the Sonoran Desert into Arizona to the Mohave Desert in California, southern Nevada, and southeastern Utah. The Mohave, Sonoran, and Sinaloan tortoises are geographic races recognized by habitat, behavioral, and molecular differences. 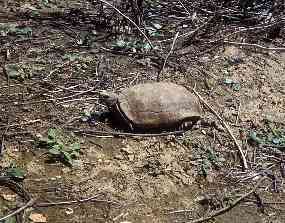 In southeastern Sonora, the Sinaloan tortoise lives in rocky slope habitats in thornscrub and tropical deciduous forest. Photo: Mark Dimmitt near San Bernardo, Son. 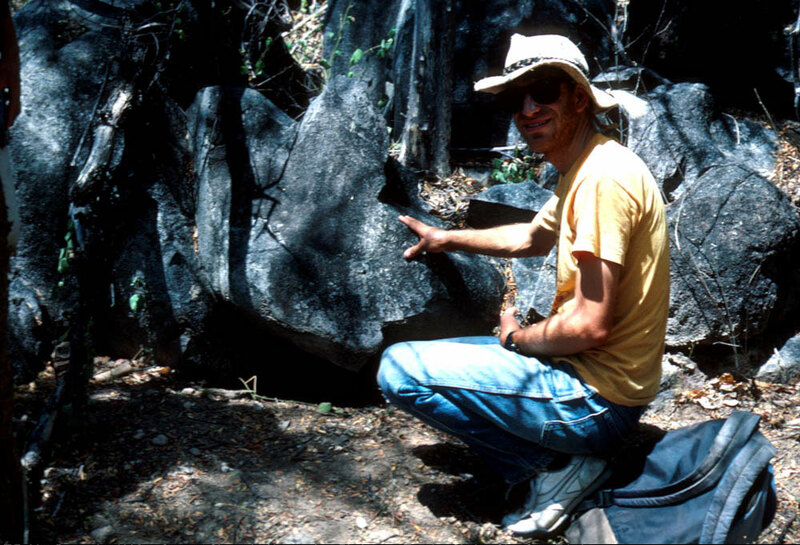 Sam Friedman pointing out tortoise shelter site in tropical deciduous forest in the Sierra de Alamos. 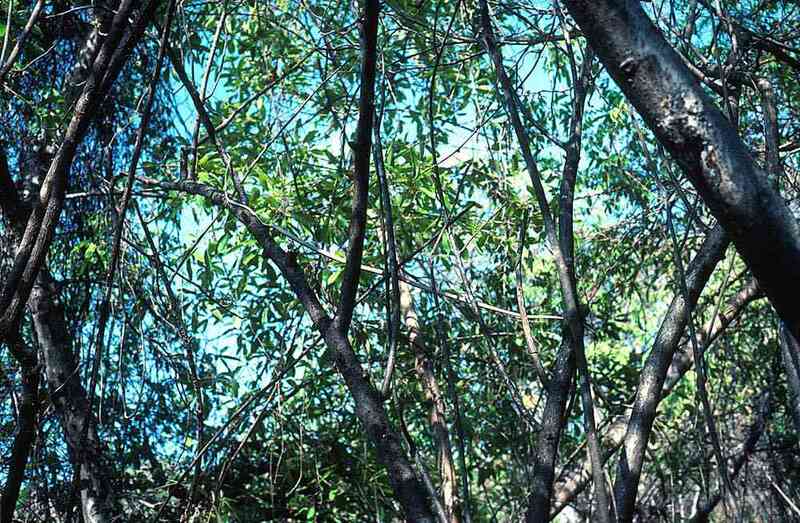 From July to early October, the canopy is continuous, and the forest understory moist and shady. The southern limit of these sun-loving tortoises may be correlated to skin diseases caused by excessive moisture. 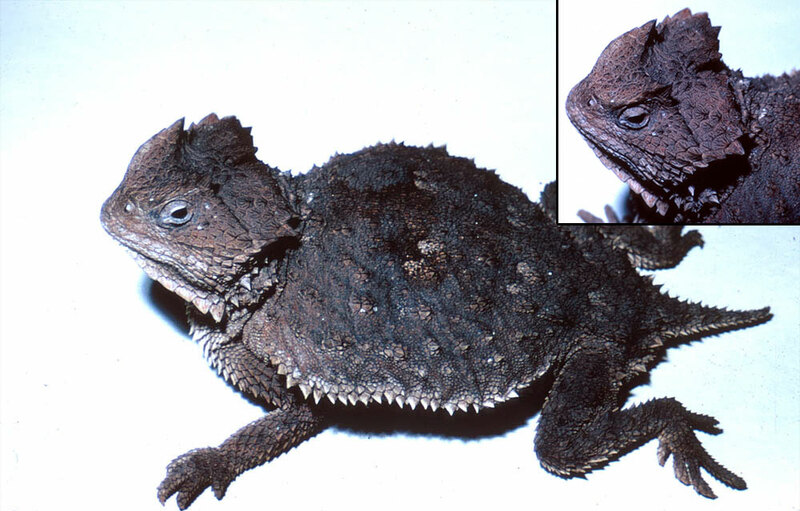 Horned lizards (Phrynosoma spp.) are bizarre lizards with flattened bodies and variously developed horns on the head that are found from Texas to California and south to southern Mexico. In Mexico, they are called camaleones although their ability to change color is very limited. The common name may be because their coloration often matches the local substrate The regal horned lizard (P. solare) shown here is found from northern Sinaloa north to southwestern New Mexico and central Arizona. In southern Sonora it lives in thornscrub and tropical deciduous forest. 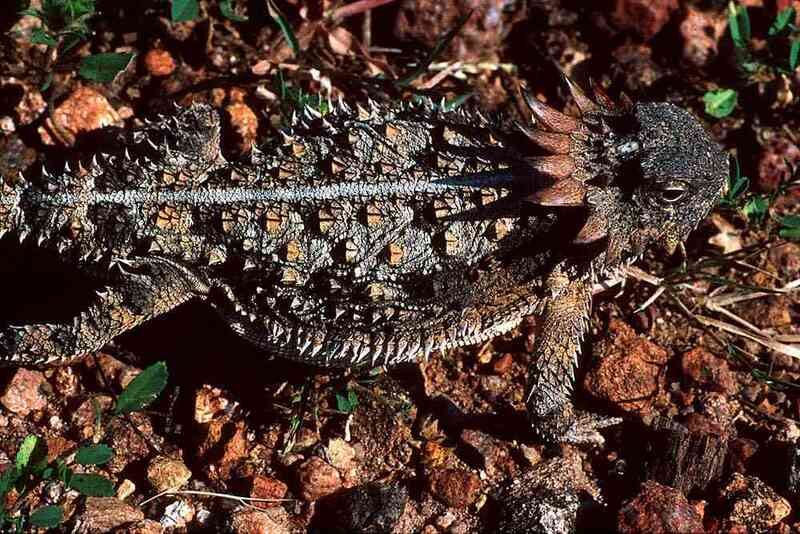 The rock horned lizard (P. ditmarsi) is the only other horned lizard known to live in TDF in Sonora. 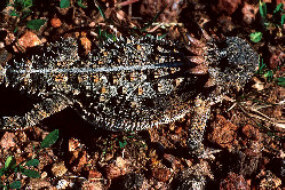 Farther north the regal horned lizard is common in desert grassland and Sonoran desertscrub. Its teeth are reduced to simple pegs without cusps, reflecting its ant-eating diet. Photo from the Sierra de Alamos, Sonora. 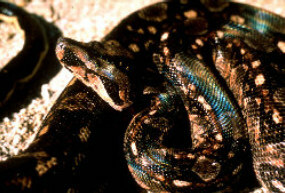 The boa constrictor (Boa constrictor) is found from South America to central Sonora. 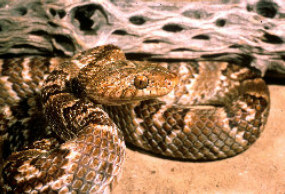 In Sonora, the Mexican boa constrictor or corúa (B. c. imperator) can be a rich dark reddish color in tropical deciduous forest or a paler grayish color in coastal thornscrub. Corúa (also coruba) is a pre-Columbian name. They are often found in canyons and are thought to be guardians of the aguajes (water holes). Unlike other serpents, killing them is thought to be bad luck (the water will dry up). Small ground boas related to the desert rosy boa (Lichanura trivirgata) were the common snakes in early Tertiary tropical forests. However, the large boa constrictors are relatively modern, appearing in the fossil record about the same time as the colubrids (Colubridae), coral snakes (Elapidae), and vipers (Viperidae) immigrated to North America from Eurasia in the late Oligocene-early Miocene (ca. 25 million years ago). Photo by R. W. Van Devender near Alamos, Sonora. 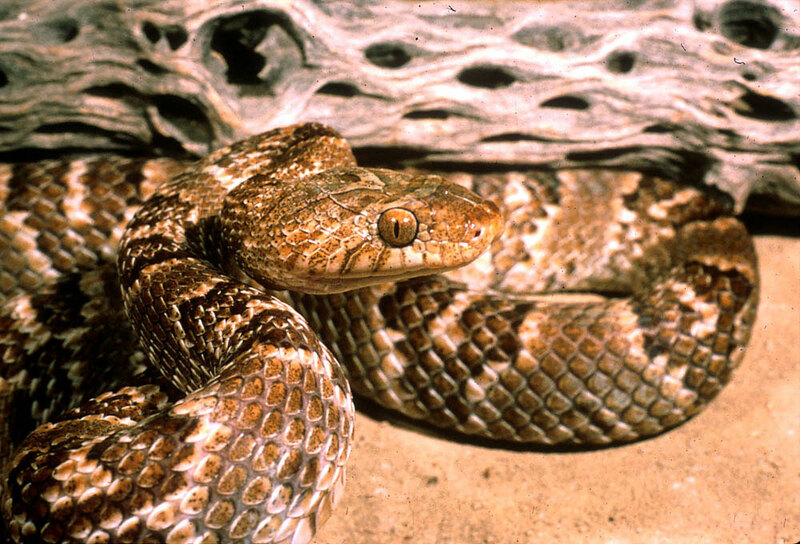 The tiger rattlesnake (Crotalus tigris) is a small crevice-dwelling víbora de cascabel in tropical deciduous forest and foothills thornscrub. In the Sonoran Desert, it is found in paloverde-saguaro desertscrub in the Arizona Upland Sonoran subdivision as far north as south-central Arizona. 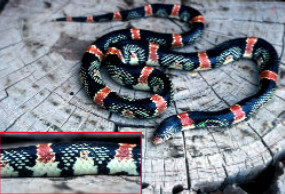 This moderately-small crevice-dweller is easily recognized by its small head, high body, and strongly banded color pattern. Like most rock-dwelling rattlesnakes, the ground color typically matches the color of the local bedrock. Photos: by R. W. Van Devender. The night snake (Hypsiglena torquata) is a small nocturnal snake that is widespread in many habitats from Colorado and Washington south to Michoacán. 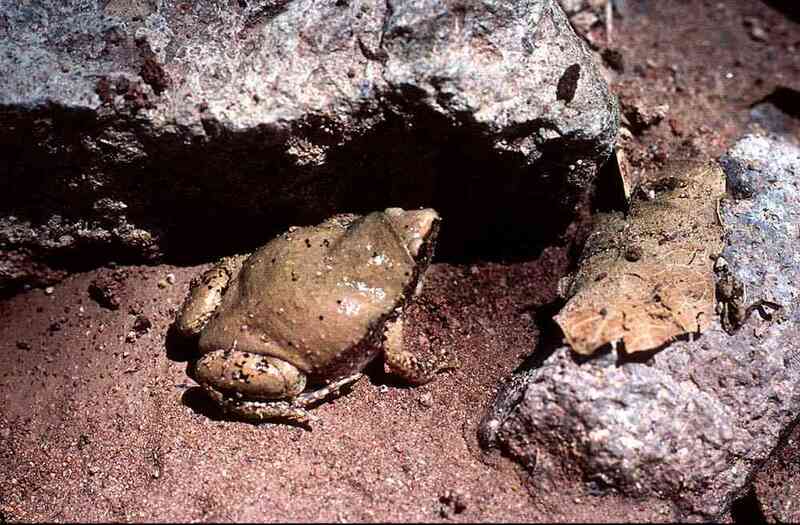 This specimen from TDF near Alamos, Sonora has the white collar typical of tropical populations. To the west at TDF-thornscrub transition, the paired dark blotches on the neck typical of more northern populations are found. The two color pattern forms have been called different species (H. torquata and H. ochrorhyncha) or subspecies (of H. torquata). They eat lizards, small snakes, frogs, and salamanders, which are subdued by injecting venom from enlarged rear fangs. Photo: R. W. Van Devender. 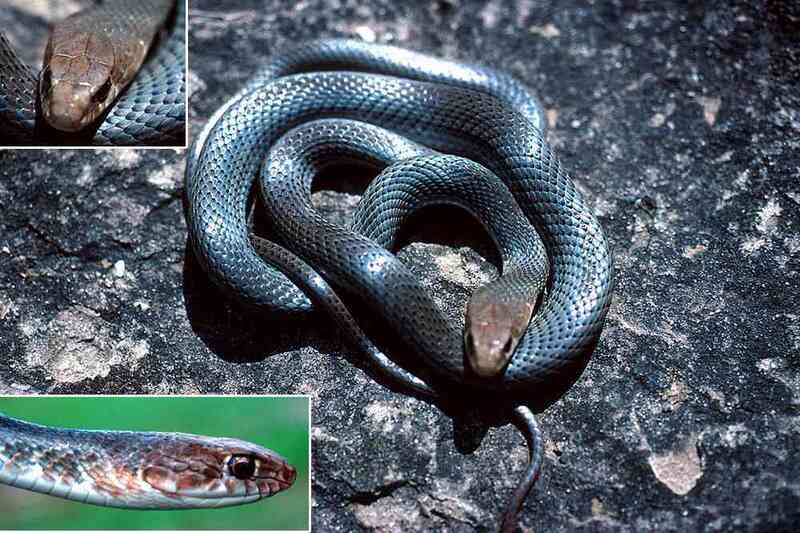 The long-nosed snake (Rhinocheilus lecontei) is a medium-sized relative of the kingsnakes (Lampropeltis spp.) 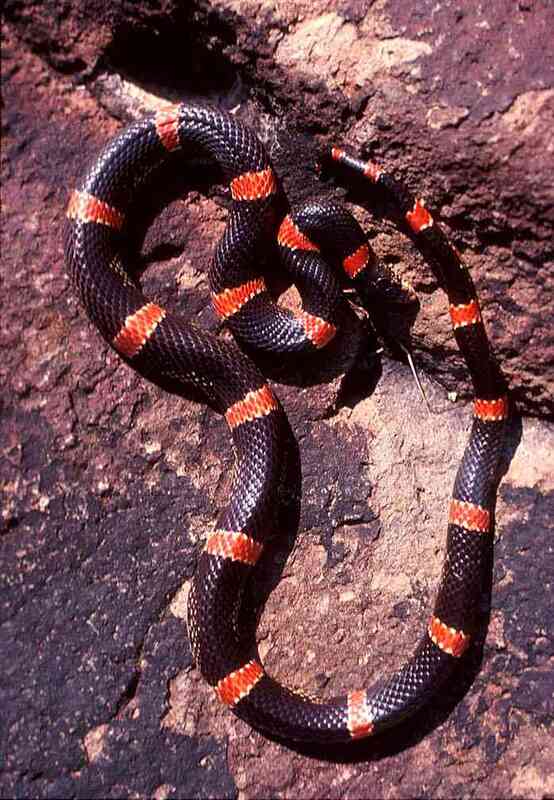 with varying amounts of red in the color pattern that is found from southeastern Oklahoma west to Idaho and California and south to southern Chihuahua and Jalisco. 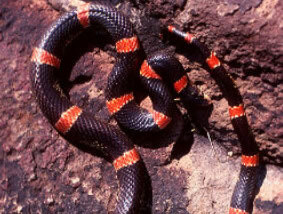 The tropical long-nosed snake (R. l. antoni) shown here has a simple color pattern with broad red bands and black bands. 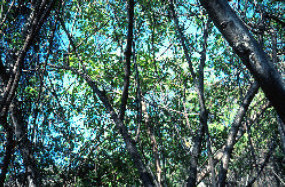 This subspecies occurs in tropical deciduous forest in southern Sonora. Photo by R.W. Van Devender near El Fuerte, Sinaloa. The range of the western long-nosed snake (Rhinocheilus l. lecontei, “clarus” phase) with a more complicated color pattern containing white speckling begins west of Alamos in the TDF-thornscrub transition and extends throughout much of the western United States. 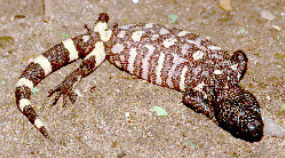 Specimen was near Navojoa, Sonora. 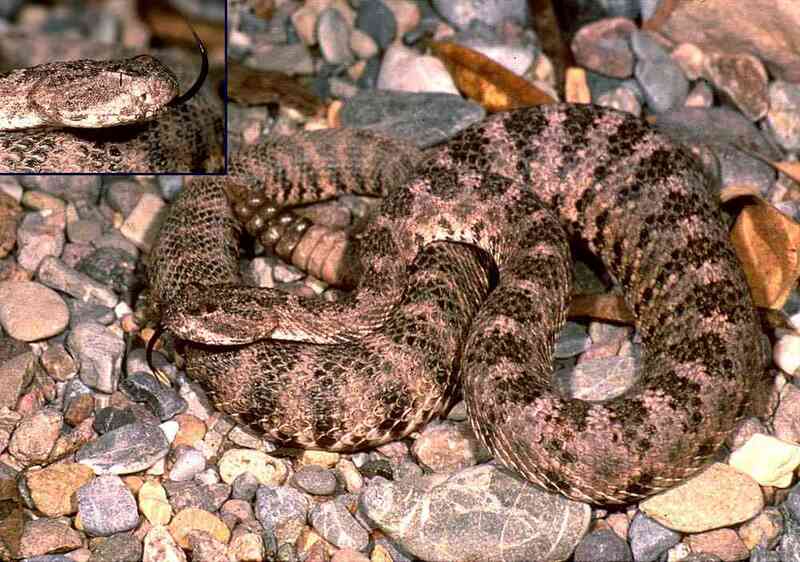 There is extensive hybridization in the TDF-thornscrub transition of southern Sonora between between two well-delineated species of lyre snakes (Trimorphodon). The Mexican lyre snake (Trimorphodon tau, above) with its strong clear color pattern is a widespread tropical snake on the west coast of Mexico, reaching its northern limits in Sonora near Tepoca in the Municipio de Yécora. Photo: R. W. Van Devender from near Alamos, Sonora. 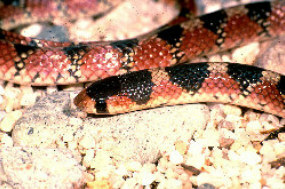 The lyre snake (Trimorphodon biscutatus) with a more mottled color pattern is widespread in the deserts of the southwestern United States and northwestern Mexico. These nocturnal, rear-fanged venomous snakes are specialized for living in rock crevices. Photo: R. W. Van Devender; specimen is from Arizona. 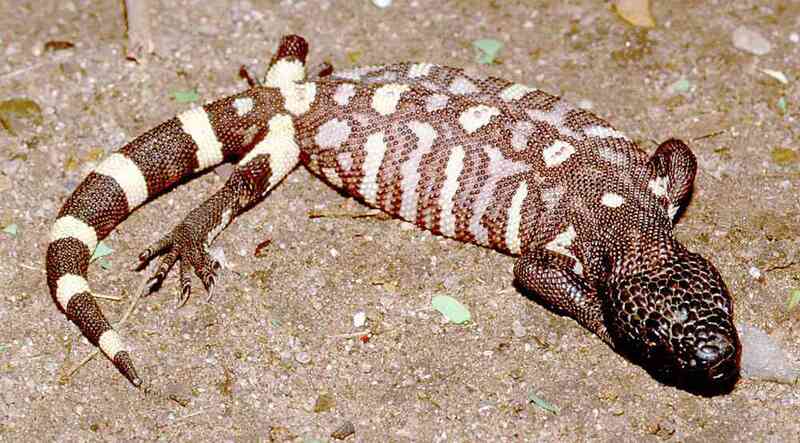 The venomous Mexican beaded lizard/escorpión (Heloderma horridum) lives in tropical deciduous forest. It is an opportunistic predator that eats many small vertebrates and their eggs. The relatively long prehensile tail helps it forage in shrubs and trees. It is most active near sunset. It is a descendent of ancient Helodermatidae that lived in early Tertiary tropical dry forests of North America 50 to 25 million years ago. Photo: C. L. Abercrombie near Alamos, Sonora. 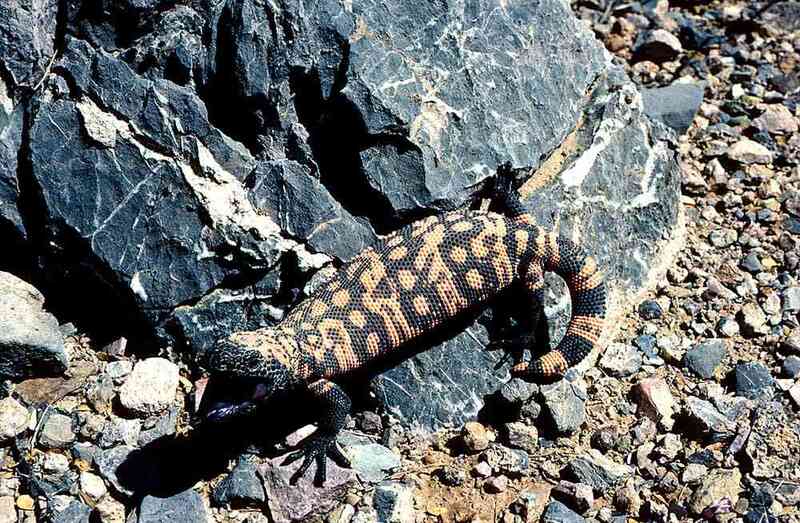 Mexican beaded lizard (Heloderma horridum) in defensive posture. 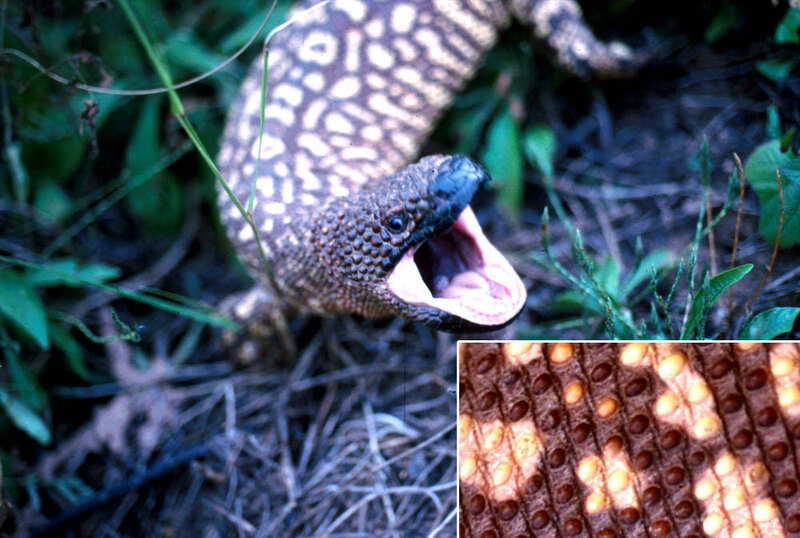 The skin of these escorpiones is well armored with bones inside each scale (osteoderms). Photos: T. L. Van Devender from near Curea, Sonora. 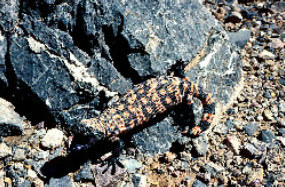 West of Alamos, the beaded lizard is replaced by the Gila monster (Heloderma suspectum) in the TDF-thornscrub transition. It ranges from southern Sonora north to southwestern New Mexico, Arizona, southern Nevada, and barely into California and Utah. Photo: T. R. Van Devender from the Waterman Mountains, Arizona. 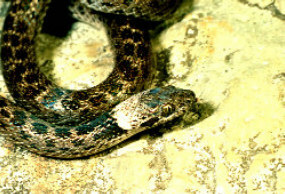 The northern range limits of some TDF animals such as the thornscrub hook-nosed snake (Gyalopion quadrangularis, above) and the brown vine snake (Oxybelis aeneus) are at 1160 to 1650 meters elevation in desert grassland/oak woodland transition in the mountains of southern Arizona west of Nogales Photo: R. W. Van Devender near Alamos, Sonora. 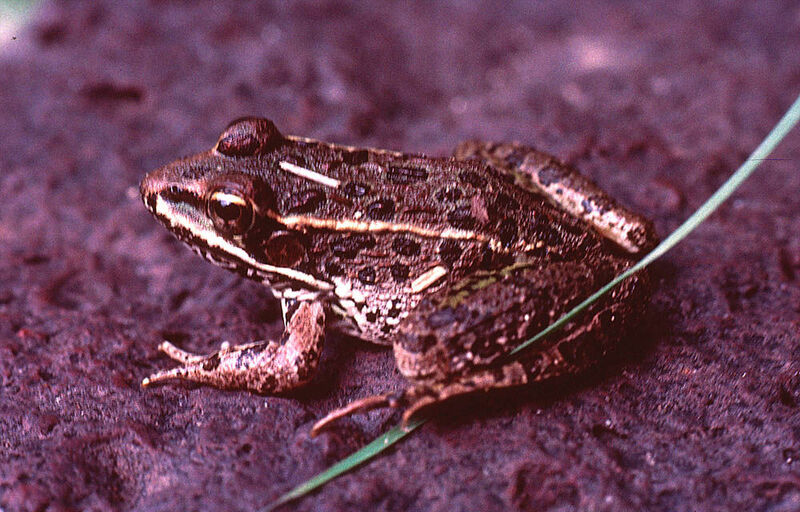 Rana magnaocularis is a wide-ranging member of the leopard frog species complex. It is common in the Yécora area as well as in tropical habitats around Alamos. The arboreal brown vine snake (Oxybelis aeneus) is found mostly in tropical habitats from Bolivia and Brazil to southern Arizona. Brown vine snakes are very difficult to distinguish from vines even at close range (above and right). These snakes are not muscular, active predators like the more-terrestrial neotropical whipsnake (Masticophis mentovarius) and coachwhip/chirrionero (M. flagellum) which often occur in the same habitats. Vine snakes use gravity to glide through tree branches. They are mildly venomous, subduing arboreal lizards and frogs with fixed fangs in the back of the mouth. The head is large and light-colored. When threatened, it opens its mouth and gapes to expose the black interior, but it rarely bites. At its northern limit in open oak woodlands near Nogales, Arizona, vines and arboreal lizards are much less common than in more tropical communities. 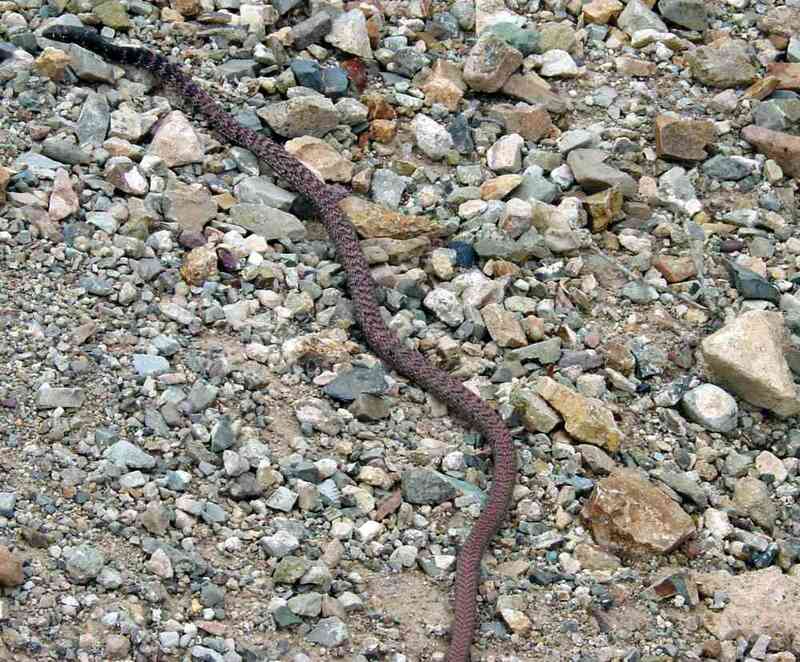 Unlike in southern Sonora where vine snakes live near sea level, they are restricted in the north to a narrow zone at 1360-1670 meters elevation where they are limited by cold at higher elevations and drought at lower elevations. Photos: above and top right: T. R. Van Devender from Alamos, Sonora; bottom right: R. W. Van Devender from Costa Rica. 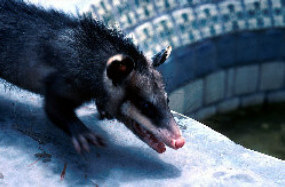 The Virginia opossum/tlacuache (Didelphis virginiana californicus) in northwestern Mexico differs from the ones in the eastern United States and introduced in California in having charcoal-colored fur and bold white facial stripes. As early as 1947 'possums were being seen in remote areas in the Huachuca and Pajarito mountains of southern Arizona, suggesting that the species has been expanding its range northward in the last 60 years.